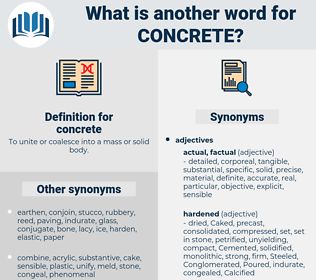 What is another word for concrete? To unite or coalesce into a mass or solid body. concerted, certain, factual, meaningful, real-world, pragmatic, country-specific, down-to-earth, real-life, airtight, exact, hands-on, perceptible, constructive, definitive, considerable, accurate, matter-of-fact, Targeted, affirmative, appreciable, empirical, discernible, on-the-ground, intangible, true, noticeable. flexible, unimportant, intangible, abstract, bending, indefinite, general, ideal, immaterial, pliable. fabricated, assumed, conceptual, conceptional, conjectural, alleged, platonic, spiritual, generalized, disembodied, thin, potential, imaginary, bodiless, supposed, vaporous, fictional, unreal, illusory, formless, legendary, fabled, ideologic, imperceptible, imagined, reputed, ideational, possible, chimerical, nonmaterial, symbolic, nonphysical, universal, visualized, hypothetical, nonexclusive, fanciful, nonspecific, conceived, unbodied, Inexistent, impalpable, unnoticeable, liquid, envisioned, airy, ideological, gaseous, Discarnate, invisible, virtual, ethereal, tenuous, pictured, Gossamery, romantic, invented, generic, fictitious, made-up, insubstantial, diaphanous, fake, metaphysical, pretend, nonexistent, insensible, incorporeal, suppositional, unsubstantial. Concrete: She never played soldier or sailed paper boats with her brothers. Certainly valuable lessons of life might be most strongly presented in this concrete form, and thus appeal with wonderful power to the young and inexperienced. 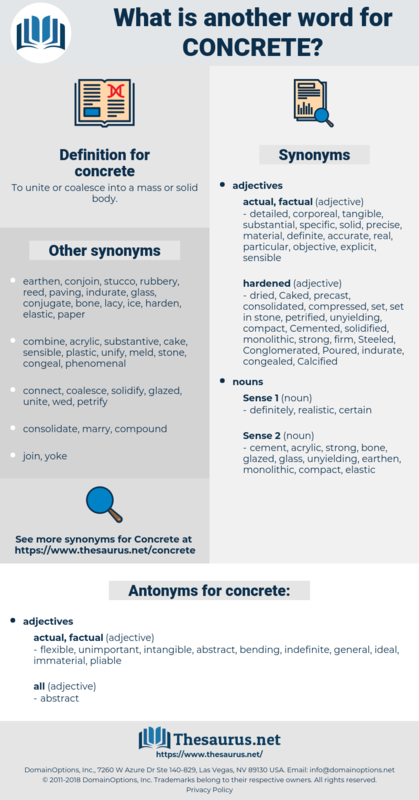 building material, paving material, pavement, paving.